Before Kana was the international superstar that she is today, she started building her career and fan base a decade earlier in Japan. After a brief break due to a health issue, Kana returned to wrestling in late 2007 and worked as a Freelancer in a variety of promotions. During this time period, a set of nine DVDs was produced by Kana of her matches from Pro Wrestling WAVE and NEO. The matches on the DVDs range from 2008 to 2010, and really show Kana’s growth from a passionate young wrestler with potential to one of the best female wrestlers in the world. I finally tracked down all nine DVDs from the set, so I figured since Kana is one of my favorite wrestlers it would be fun to watch and review them. I’ll provide context before each match if there is anything noteworthy I can find, although of course not all matches in wrestling have a set purpose (especially with Freelancers like Kana). All the matches below took place in Pro Wrestling WAVE and are from the first quarter of 2008. All wrestlers on the DVD have profiles on Joshi City, you can click on their names above to go straight to their profile for additional information. I am not sure why Kana and Kyoko Kimura hated each other coming into the match, but they sure did start with the fire. This is their first in-ring encounter I could find, however Kyoko Kimura and Kana were both in NEO (once Kana returned) and Kyoko was a heel so that is likely where the bad blood started. Even though this was an itty bitty WAVE show that wasn’t taped for TV, Kyoko and Kana have no chill so they wrestled the same as if they were in front of a world wide audience. Kana attacks Kyoko before the match starts, but Kyoko throws her out of the ring and they trade elbows out on the floor. Kyoko throws Kana into chairs at ringside, Kana fights back and clubs Kyoko but she is send into the chairs again for her trouble. Kyoko drags Kana back into the ring by her hair before flinging her down, but Kana gets back up and they trade elbows. Kana gets Kyoko to the mat but Kyoko applies a kneelock, she goes for Kana’s arm but Kana blocks the armbreaker attempt. Kyoko and Kana trade mounted elbows, slaps by Kyoko and she goes for the sleeper. Swinging sleeper by Kyoko and she locks on the hold on the mat, but Kana eventually gets a hand on the ropes for the break. Kyoko knees Kana and boots her in the head, she goes for a running boot but Kana blocks it. Kana goes for a hip attack but Kyoko gets a boot up, she headbutts Kana’s next attempt but Kana applies a German suplex hold for two. Boot to the head by Kyoko in return, and she covers Kana for her own two count. Kana gets up and hits elbows but Kyoko elbows her against the ropes, they trade slaps until Kyoko headbutts Kana, but Kana hits her own headbutt. Another headbutt by Kyoko and she applies a sleeper, and this time Kana can’t reach the ropes and goes to sleep! Kyoko Kimura is the winner! Warning: This Match Is Heavily Clipped. 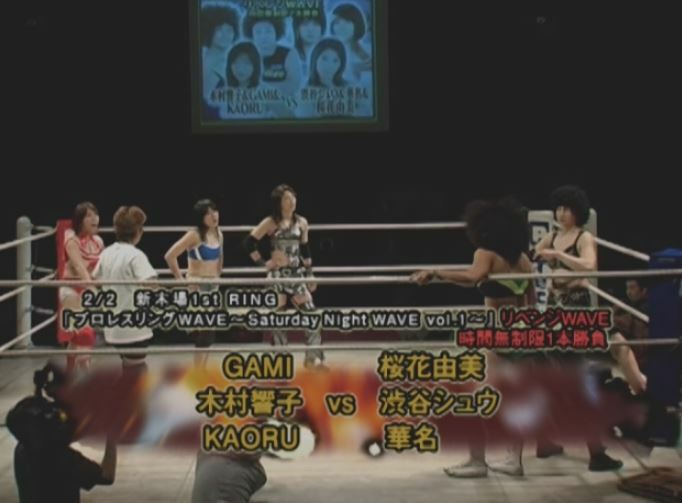 Finding old Pro Wrestling WAVE news/results is not the easiest thing in the world to do as in 2008 they were one of the smallest Joshi promotions (still are), so I can’t really explain the backstory behind the match. GAMI, KAORU, and Kyoko were clearly the heels here though as they refuse to shake hands before the match (and as we saw in the prior match, Kyoko is pretty vicious). 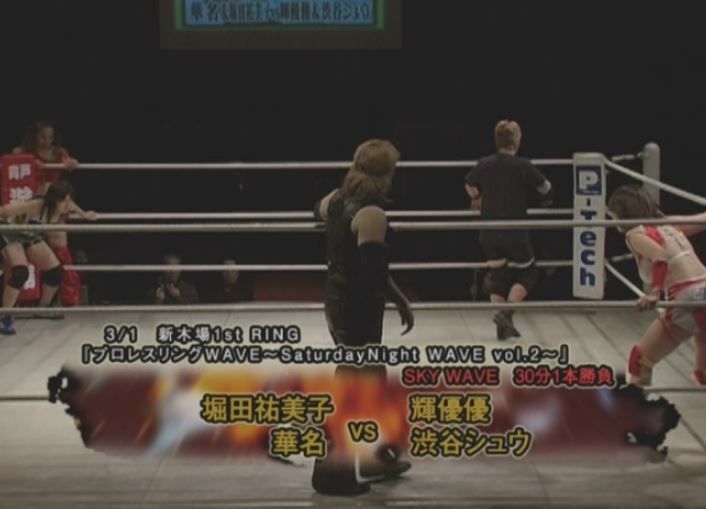 The GAMI trio became a regular group in November of 2007 and since the match was billed as “Revenge WAVE” we can assume this match will bring some hate. It was also the main event of the evening, ramping up the pressure to put on a good show so the fans went home happy. Kana and Kyoko immediately go to the floor trading elbows, while KAORU is singled out in the ring by Shuu and Ohka. We clip ahead to Kana in the ring with Kyoko, headbutt by Kyoko and she covers Kana for two. Boots by Kyoko and she tags in GAMI, pump-handle slam attempt by GAMI but Kana reverses it into a DDT. We jump ahead to GAMI hitting a German suplex onto Kana and GAMI rakes her eyes with her boots. Kyoko comes in to help as GAMI hits a lariat onto Kana, pump-handle slam by GAMI but the cover is broken up. GAMI goes up top but Kana avoids her dive, cradle by Kana but it gets a two count. Kyoko comes in but Kana swings Kyoko into GAMI, Kyoko and Kana trade elbows as GAMI comes over, but Kyoko headbutts GAMI by accident. German suplex hold by Kana to GAMI, but it gets a two count. Kana goes off the ropes and nails the Billiken, but that cover gets two as well. KAORU comes in and hits Kana with a piece of board, Shuu tries to help but KAORU catches her with a backbreaker. Fisherman Buster by GAMI to Kana, and she gets the three count! GAMI, KAORU, and Kyoko Kimura win! Obviously this was too clipped up to get excited about. Kyoko and Kana continued their heated exchanges and everything they showed was fine, but with only 20% of the match shown, hard to really good a feel of it. Even though these two teamed just a few weeks prior, it was more of a “random team” situation than a bunch of friends getting together. Even though Ohka began wrestling in 2001, she was mostly an upper midcard gatekeeper at this point in her career and had never won any titles. She still outranked Kana however, as Kana was not only a Freelancer but had only recently returned from a long layoff and had to work her way back to bigger matches. This match was actually second from the bottom on the card, and while match order isn’t everything, it does show that both of them weren’t yet a major story in the promotion (which would change just a few years later). Kana and Ohka lock up to start, Kana gets Ohka into the ropes and hits a few elbows, but Ohka comes back with a dropkick. Kana hits a dropkick of her own, snapmare by Kana and she puts Ohka in a bodyscissors. Ohka gets out of it and puts Kana in a stretch hold, rolling guillotine by Ohka but Kana gets out of it and applies a crab hold. Ohka gets into the ropes for a break, armdrag by Ohka and she puts Kana in a crucifix hold. Kana gets a foot on the ropes, Ohka chokes Kana but Kana sneaks in a sunset flip for two. Crab hold by Kana but Ohka gets to the ropes again, Ohka throws Kana into the corner but Kana hits a second turnbuckle hip attack. Another hip attack by Kana and she hits a third for a two count. Knees by Kana but Ohka hits a hip toss and puts Kana in a short armbar. Kana gets a foot on the ropes, Ohka chokes Kana and elbows her against the ropes. Ohka charges Kana but Kana holds down the top rope, sending Ohka to the floor. Ohka gets on the apron but Kana hip attacks her back down, Kana goes out to the apron and she hits a diving hip attack to the floor. Kana elbows Ohka but Ohka hits a hip toss on the floor, Ohka picks up Kana and slides her back into the ring. Ohka throws Kana into the corner and hits a big boot, another big boot by Ohka and she covers Kana for two. Double underhook suplex by Ohka, she picks up Kana and they trade waistlocks. Reverse DDT by Kana, she goes up top but Ohka avoids the diving hip attack attempt. Ohka goes for a big boot but Kana ducks it and schoolboys Ohka for a two count. Kana applies a modified STF but Ohka crawls to the ropes for the break, hip attack by Kana in the corner but Ohka avoids the second one and applies a cross arm submission over the top rope. Ohka goes up top and hits a missile dropkick, cover by Ohka but Kana kicks out. Ohka picks up Kana but Kana hits a DDT, German suplex hold by Kana but Ohka gets a shoulder up. Kana picks up Ohka but Ohka elbows her off, Ohka and Kana trade elbows until Ohka sends Kana to the mat. Kana quickly gets back up and hits a hard elbow of her own, she goes off the ropes and nails the Billiken, but her cover only gets two. She goes off the ropes again but Ohka delivers the big boot, Ohka goes up top but Kana slaps her before she can jump off and joins her. Avalanche DDT by Kana, but Ohka barely kicks out of the cover. Cutie Special by Kana, but that gets a two count as well. Kana goes off the ropes but Ohka catches her hip attack attempt and hits a German suplex, Ohka picks up Kana and she hits a vertical suplex. Ohka picks up Kana again and delivers the choke bomb, and she picks up the three count! Yumi Ohka wins the match. Even though Kana and Yumiko Hotta would later be in Passion Red together, this match slightly pre-dates that as Passion Red wasn’t officially formed until a month after this show (and Hotta didn’t join the group until September 2008). Like Kana, Hotta was a Freelancer at the time and wrestled in SUN, NEO, and many other places. Ran Yu-Yu was also a Freelancer, but best known for her work in OZ Academy, while Shuu Shibutani was a young WAVE wrestler. Kana and Shuu start the match and get right into it with dropkicks and elbow strikes, Hotta comes in to help and they double team young Shuu. We clip ahead to Yu-Yu in the ring with Hotta, Hotta goes for Yu-Yu’s arm but Shuu quickly breaks things up. Hotta tags in Kana, hip attacks by Kana to Yu-Yu and Shuu and she hits Yu-Yu with a diving hip attack for a two count. Kana goes to run off the ropes but Yu-Yu grabs her from behind, knee by Yu-Yu and she kicks Kana in the ribs. Yu-Yu gets Kana on her shoulders and gives her the airplane spin, but Kana slides off and rolls her up for two. Modified STF by Kana, Shuu tries to break it up but Hotta stops her and puts Shuu in an ankle hold. Yu-Yu eventually gets into the ropes for the break, the match jumps to Shuu in the ring with Kana and she applies a cradle for two. A Northern Lights Suplex by Shuu gets a two count as well, Shuu goes off the ropes but Kana blocks her bodyscissors takedown and hits a German suplex hold for a two count. DDT by Shuu, she goes off the ropes but Kana catches her with a lariat. Kana picks up Shuu and hits the Cutie Special, but Yu-Yu breaks it up. Hotta wants the tag, Kana doesn’t want to tag her in so Hotta blind tags in herself. Billiken by Kana, Hotta picks up Shuu and she nails the Pyramid Driver for the three count! Kana and Yumiko Hotta are the winners! 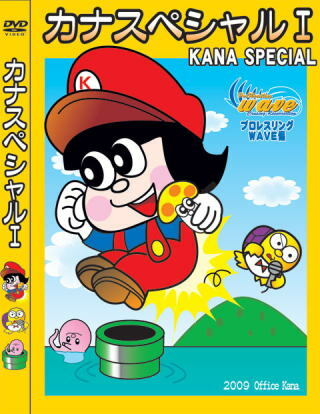 One of the fun things about these matches is just seeing Kana with a different move set, as again she hit the Cutie Special which is a move she hasn’t done in a long time. This was pretty clipped up so impossible to get a feel for, but Kana looked great and Hotta being her usual stubborn self added an extra element to it. The full match was probably a lot of fun since their chemistry was solid, good for what they showed but too condensed to recommend. In case you can’t tell from the attendances, WAVE wasn’t exactly the biggest Joshi promotion, but it was a good place for Kana to hone her craft against a variety of opponents. Here she teams with Ohka, who she wrestled the month before, as she faces Shuu Shibutani again. Hiroyo Matsumoto is the new element to this match, she was still early in her career but was being pushed stronger than most young wrestlers right out of the gate as she showed a lot of potential from the start. Kana and Hiroyo start the match, they tie-up and Kana elbows Hiroyo into the ropes. Hiroyo elbows her back but Kana delivers a dropkick, Ohka comes in but Shuu hits a diving crossbody onto both of her opponents. Shuu and Hiroyo both attack Kana in the corner, senton by Shuu and Hiroyo hits a leg drop on Kana for a two count. Shuu stays in with Kana, she throws Kana into the ropes and delivers a sliding boot. Scoop slam by Shuu and she hits mounted elbows, she goes for a cross armbreaker but Ohka breaks it up. Shuu keeps on Kana’s arm but Kana rolls her up for two, Irish whip by Kana and she delivers a dropkick for two. Kana tags in Ohka, big boot by Ohka to Shuu and she hits two more for a quick cover. Scoop slam by Ohka and she puts Shuu in a crab hold, but Hiroyo breaks it up. Ohka puts Shuu in a bodyscissors and applies a sleeper hold, cross armbreaker attempt by Ohka but Shuu blocks it so she applies a triangle choke instead. Shuu gets a foot on the ropes to force the break, Ohka throws Shuu into the corner but Shuu rebounds out with a crossbody and tags in Hiroyo. Shoulderblocks by Hiroyo to Ohka, she goes off the ropes but Ohka tosses her to the mat. Ohka tags in Kana, stomps by Kana to Hiroyo but Hiroyo hits a hard shoulderblock. Kana hits a jumping hip attack in the corner and stomps on Hiroyo, but Hiroyo switches positions with her and returns the favor. Kana grabs Hiroyo from behind as they go back and forth with strikes, hip attack by Kana and she slaps Hiroyo in the face. Backbreaker by Hiroyo but Kana hits a reverse DDT before tagging in Ohka. Ohka boots Hiroyo in the face but Hiroyo catches her with a side slam, Hiroyo gets on the second turnbuckle and she hits a missile dropkick for a two count. Hiroyo tries to get Ohka on her shoulders but Ohka blocks it, armdrag by Ohka and she puts Hiroyo in a crucifix armbar. Shuu tries to break it off but Kana comes in too and trades elbows with her. Hiroyo eventually gets to the ropes for the break, big boot by Ohka to Hiroyo in the corner and Kana drops her with a face crusher. Springboard elbow drop by Ohka, but Hiroyo kicks out of the cover. Shuu comes in with a swandive dropkick to Ohka, double atomic drop to Ohka and Shuu hits a DDT. Hiroyo picks up Ohka and gets her on her shoulders, Kana comes in but Hiroyo throws Ohka onto her. Shuu returns but Ohka blocks the suplex attempt, she goes for a suplex but Shuu gets out of it and hits a DDT. Jumping DDT by Shuu, but Ohka gets a foot on the ropes on the cover. Ohka tosses down Shuu and nails a big boot, Hiroyo comes in and hits Ohka from behind, allowing Shuu to roll her up for two. DDT by Shuu, she goes off the ropes but Ohka catches her when she goes for a hurricanrana and hits a powerbomb. Ohka tags in Kana, Kana comes in the ring with a diving hip attack off the top turnbuckle, but her cover gets two. Kana picks up Shuu, Ohka boots her and Kana hits a German suplex hold for two. Kana goes off the ropes but Shuu ducks the Billiken and rolls up Kana for a two count. Kana picks up Shuu but Shuu avoids her charge and snaps Kana’s neck over the top rope. Shuu goes up top but Ohka grabs her from the apron, Kana joins Shuu and hits a couple hip attacks. Hiroyo tosses Kana back to the mat and Shuu delivers the missile dropkick, shoulderblock by Hiroyo and Shuu hits the Northern Lights Suplex for two. Shuu goes up top and nails the diving senton, but Ohka breaks up the pin. Shuu goes off the ropes but Ohka boots her, Ohka puts Shuu on the top turnbuckle and Kana hits an avalanche DDT. Reverse elbow drop by Ohka off the top turnbuckle, Kana picks up Shuu and hits the cross-legged Cutie Special, but Hiroyo breaks up the cover. Hiroyo lariats Kana, cradle by Shuu on Kana but that gets two also. Ohka boots Shuu, Hiroyo tries to help but she missile dropkicks Shuu by accident. Choke Bomb by Ohka to Shuu, Kana then nails her with the Billiken for the three count! Kana and Yumi Ohka are the winners! Pro Wrestling WAVE had two events on March 20th, and this was the opening match on the “bigger” show of the two. Misaki Ohata debuted in December 2006 while Hanako Kobayashi (better known today as Hanako Nakamori) debuted in July 2006, so both still were pretty early into their careers. After being on the wrong side against Shuu the last few months, here Kana is back teaming with her, just further showing that many of these tags teams are just randomly put together for our amusement. Hanako and Misaki charge their opponents as the match starts, getting out to the early advantage. They isolate Kana, Kana tries to jump on the top turnbuckle but loses her balance. Luckily she grabs the rope so she doesn’t tumble out of the ring and they get back into a groove, as Kana dropkicks Hanako in the corner. Kana tags in Shuu, scoop slam by Shuu to Hanako and she covers her for two. Bodyscissors by Shuu and she goes for Hanako’s arm, but Hanako gets away and stomps on Shuu. Hanako tags in Misaki and Misaki throws down Shuu by the hair before dropkicking her. Chinlock by Misaki but Shuu gets out of it, Shuu tags in Kana and Kana drops Misaki with a dropkick. Another dropkick by Kana, and she covers Misaki for two. Kana puts Misaki in a stretch hold, but Hanako runs in to break it up. Misaki sneaks in a backslide which gives her time to tag in Hanako, Hanako flings Kana to the mat and hits a running crossbody for a two count. Irish whip by Hanako but Kana hits a dropkick, she tags in Shuu and Shuu scoop slams Hanako before putting her in a crab hold. Hanako gets into the ropes for the break, Shuu goes for a crossbody out of the corner but Hanako ducks it and they trade elbows. Misaki comes in but Shuu avoids their dropkick and hits a senton on Misaki while Kana hits an elbow drop onto Hanako. Kana stays in and with Misaki they hit a double atomic drop onto Hanako, elbow by Kana and Shuu drops Hanako with a DDT for a two count. Kana is tagged back in and she hits a hip attack, another hip attack by Kana and she covers Hanako for two. Kana boots back Hanako repeatedly but Hanako hits the neck drop followed by a jumping crossbody. Another crossbody by Hanako and one more, cover by Hanako but Kana gets a shoulder up. Kana tries to dropkick Hanako when she goes for a crossbody but the timing is off and she misses, Kana applies a Scorpion Deathlock but Misaki breaks it up. Kana elbows Misaki as Shuu and Hanako come in, Kana and Shuu are stacked in the corner and Kana is repeatedly dropkicked. Hanako tags in Misaki, Irish whip by Misaki and she hits a crossbody onto Kana for a two count. Kana comes back with a hip attack in the corner, she then gets on the top turnbuckle and hits a missile dropkick. She goes back up top and his a second missile dropkick, but Misaki bridges out of the pin. Misaki pushes Kana away and applies a cross armbreaker, but Shuu runs in to break it up. Hanako positions Kana while Misaki goes up top and hits a diving body press onto Kana’s arm, cross armbreaker takedown by Misaki but Kana gets a foot on the ropes for the break. Misaki goes off the ropes but Kana ducks her elbow, reverse DDT by Kana and she covers Misaki for two. Kana gets on the top turnbuckle and delivers the diving hip attack, but Misaki barely kicks out of the pin. Kana tags in Shuu, DDT by Shuu but Hanako runs in to help Misaki regain control. Misaki goes off the ropes but Shuu avoids the lariat and drops Misaki with a DDT for two. Shuu goes up top and hits a missile dropkick, she goes off the ropes but Misaki catches her with an armdrag and applies an armbar. Shuu gets to the ropes for the break, Misaki picks up Shuu and applies a cradle for two. She goes for another one but Shuu sits down to block it, Hanako comes in and they both dropkick Shuu. Misaki goes up top and hits the diving body press, but Shuu barely gets a shoulder up. Misaki goes off the ropes but Shuu hits a Northern Lights Suplex, Shuu gets on the top turnbuckle but Hanako tosses her back to the mat. Now it is Misaki that goes up top but Shuu gets her feet up on the diving body press, Hanako boots Shuu while Kana runs in and hits the Billiken onto Misaki. Shuu goes to the top turnbuckle and she nails the diving senton, picking up the three count! Kana and Shuu Shibutani win! The effort was there, but this was the first match that had some really noticeable mistakes. Kana was in on two of them (although with one spot it was hard to tell who was at fault), but it wasn’t just her as multiple parts just looked awkward or done poorly. This isn’t incredibly rare of course with young wrestlers that don’t face off too often against each other, but of all the matches on the DVD, this was the only match that so many issues. A decent match otherwise, but the occasional mistake really hurt the overall flow and brought it down a notch or two. These DVDs are not designed to be “Best Of Kana,” but rather a chronicling of her career, which is why most of the matches were tag matches on small WAVE shows. Still, several of the matches were really entertaining, highlighted by Kana beginning her feud with Kyoko Kimura. Kana vs. Yumi Ohka was borderline fantastic as they had great chemistry, and no matches on the DVD were bad. A good start to the Kana Special DVD Series.